Ground-level ozone, the key ingredient of smog, has long been known to plague urban communities throughout the country. But new findings are revealing that ozone is fast becoming a major health threat in rural communities throughout the Rocky Mountain region. Ozone is a well-known threat to human health. While up high ozone protects us from ultraviolet radiation, down low it corrodes lungs, triggers asthma attacks, and can even cause premature death. The latest health science though, is showing that even at low levels, ozone is hazardous to our health. In fact, the EPA just adopted stronger limits on ozone nationwide (although the new limits were roundly criticized for not going far enough to safeguard public health). The take home message here is that ozone is no longer just an urban pollution problem in the Rocky Mountain region. So what's to be done? If it's not already clear, there's a connection between unprecedented levels of oil and gas drilling and unprecedented levels of ozone. As we've pointed out before, the oil and gas industry is a burgeoning source of ozone forming pollution. Vapors from tanks and gas wells, as well as emissions from drill rig engines and trucks, are all on the rise. If we're going to clean up our Rocky Mountain skies, then we need to clean up the oil and gas industry. Like we always say, although smoggy skies may be on the rise, we know what needs to be done to reverse this trend. Rocky Mountain Clean Air Action is going to start calling on states throughout the region to start cleaning up air pollution from the oil and gas industry and keeping communities safe and healthy. Gas Drilling in the Jonah Field of Western Wyoming is Fouling the Air (image from Biodiversity Conservation Alliance, courtesy of EcoFlight). The CEMEX cement plant is one of the worst polluters in the Denver metro area, spewing massive amounts of smog-forming nitrogen oxides, along with toxic mercury and dioxins, near the town of Lyons. Not only that, but the plant regularly violates clean air laws. Most recently, the Environmental Protection Agency found CEMEX is illegally operating the Lyons plant without using up-to-date pollution controls. That's why Rocky Mountain Clean Air Action has taken aim at CEMEX's air pollution permit. Citing the failure of the cement plant to use up-to-date pollution controls, we've asked the EPA to overturn CEMEX's permit and make the company use the best available pollution controls. Under the Clean Air Act, any citizen has the right to petition the EPA to object to the issuance of an air pollution permit. The petition in this case is a formal request for the government to do something; in this case, make CEMEX follow the law. The EPA has to respond to our petition within 60 days. It's an unprecedented step; citizens have never before challenged CEMEX's air pollution permit. Although we hope CEMEX comes to its senses and cleans up its act, we're not holding our breath. As we've learned time and time again, it takes vigilant citizen pressure to hold polluters accountable to clean air and our health. We'll be keeping the pressure up until CEMEX is cleaned up once and for all. There has been a lot of press lately regarding the discontent of the oil and gas industry over the new rule making proceedings which have taken place over the last couple of months in Denver. Folks from the industry have complained about perceived alienation from what they have characterized as an opaque and exclusive process. Further, they have clearly stated that they are anxious about new regulation to be promulgated by the Colorado Oil and Gas Conservation Commission as a result of recent legislation calling for balanced energy development with specific provisions protecting Colorado's environment and wildlife populations. Please industry. Give me a break. I have had the unique privilege to attend, via teleconference, approximately half of these meetings. As a land and mineral owner in the midst of intense development, I'd like to remind industry and assure the public that, at least in my opinion, these meetings have provided an extraordinary degree of multi-lateral participation including noted points of often detailed concern. If the industry feels they have been in any way slighted, it is through their own failure to take advantage of the format provided to all stakeholders. With opportunities to submit written comment and the meeting rooms half to 2/3 full of industry heavies, like lawyers, technical experts, operational mangers, high level supervisors, and association representatives, I think they have actually taken strong advantage of the process. Throughout, industry has squawked about constitutional violations, jurisdictional limits to the COGCC's authority, what they have perceived as the potential "taking" of mineral owner's rights by prohibitive drilling, and misinterpreted legislative intent. With what amounts to legal body-checking at every conceivable conversational intersection, I am surprised at how well the Department of Wildlife, Colorado Department of Public Health and Environment and the Colorado Oil and Gas Conservation Commission have held up. Some legislators, however, seem to be decompressing. The organizational and financial prowess of the industry is ever evident and working hard to protect their business interests. While industry has raised a valid point against duplicity and the inefficient, wasteful practice of reporting the same information to multiple agencies, over the years such fractured jurisdiction has singularly benefited the industry - by intentional design. Pipelines, drilling, spills -- all reporting on related field operations have been scattered hither and yon over numerous state and federal agencies, making it extremely difficult for any one agency (let alone an unsuspecting public) to get a handle on collective data, assess impacts and protect public health and safety. The COGCC is striving, to their credit, to broaden their perception of field operations by requesting an accounting of chemicals and facility equipment on site. This agency has the responsibility of clean up when facilities are abandoned (not an unheard of practice in the history of this industry). Since corporations no longer have to pay into the Superfund, that legislative safety net has been weakened. Further, loopholes in bankruptcy laws allow large-scale industrial polluters a valuable strategy to limit their environmental liability by potentially settling governmental claims for cents on the dollar. Though the COGCC knows how many wells are in existence, they currently have no way of knowing how many pads there may be. With pits and associated questionable chemical and cuttings waste on pad sites, the state is simply requesting an inventory. Industry: this is not punishment - it is prudence. How is DOW faring under their new legislative mandate? Even though there are conceivably no critical habitat/wildlife conditions under which the DOW can prevent drilling if the industry wishes to pursue it, the industry is resisting even voluntary good practices and efforts at consultation regarding these issues. Again, the industry clearly wishes to trump and thereby prevent DOW from managing wildlife on private lands where drilling rights are involved. “The US Fish and Wildlife Service has estimated that half of the species listed as federally endangered or threatened have eighty percent or more of their habitat on private lands.” Home Owners Associations, like Grass Mesa, should not have the final say in wildlife management - even if industry antes a million on the table. What does this tell you about industry? It tells me that they are simply interested in pursuing mineral resource (and profit) at break-neck speed and crushing density, damning the consequences - which have already shown themselves to be complex, destructive and significant. In response to long overdue regulatory review, industry has said they might have to leave the state. This is like a big bully standing on someone's foot and saying "Hey, if you don't stop yelling in my face, I may have to step off of your foot." Industry: the legislators aren't asking you to go away. The COGCC isn't asking you to go away. The people of Colorado aren't asking you to go away. We just want you to get off our foot. I think most people in industry would understand that. It's industry as a collective corporate empire, seeking strong profits within a framework of heretofore allowable abuse that cannot seem to understand the need to pursue their interest in a balanced manner which supports conservation. No one can expect an 'entity' driven by a moral philosophy of profit to understand the need to protect our water, air and land for ourselves, the next generation and the symbiotic life that shares our planet and sustains the ecological balance we rely upon. I am grateful the legislature has finally responded proportionately (not emotionally) to industry's impact with new mandates to bring accountability to the process of energy development. Everyone in Colorado should be grateful. Industry, please stop railing against common-sense measures to bring balance to a grossly unbalanced situation - one that is costing the rest of us dearly every day of our lives. In other words, get off our foot. To paraphrase Mark Twain, suppose you were an idiot. And suppose you were an oil and gas driller in Colorado. For those not tracking the process, the Colorado Oil and Gas Conservation Commission is proposing new rules to make sure oil and gas drilling is done right in Colorado. Doing it right means safeguarding clean air, clean water, and our communities. It means doing things that make sense. But sensibility is a virtue that oil and gas drillers seem unable to grasp. Although one would think industry, too, would be supportive of safeguarding public health, that doesn't appear to be the case. Instead, industry has launched into what we can only describe as a juvenile temper tantrum. You know, the kind our kids throw when they don't get the dessert they want on Sunday night right before bedtime? Or the kind they throw when they can't get a gumball on the way out of the grocery store? You get the picture. And the tired one-liner industry keeps using? The new rules are "one-size fits all." Let's be clear. If there's anything "one-size fits all" here, it's the fact that oil and gas drillers in Colorado seems opposed to any and all efforts to safeguard public health and our communities. In the last several years, efforts to protect clean air and clean water (including people's drinking water) have met nothing but resistance from drillers. Predictably, industry's fight and rhetoric continues. Amazingly, the "one-size fits all" proposals that industry is now opposing include rules that would require companies to reduce their air pollution when they finish drilling natural gas wells, to develop a plan to keep chemicals from spilling into drinking water supplies, and to clean up production waste so that land can be used again for homes and businesses. These proposals are so sensible that most (but unfortunately not all) companies in Colorado are already doing this stuff. Let's get beyond the rhetoric though. The idiocy notwithstanding, we think industry's real gripe is that they're not the ones writing the new rules. And as far as industry's threat to leave Colorado if these new rules are adopted? While it's a weak bluff, we say that if oil and gas drillers would rather leave Colorado than safeguard public health and our communities, then good riddance. If oil and gas drillers think it's too much for us to ask them to clean up their messes, keep our drinking water clean, and keep our air clean, they must either think we're stupid or...well, they really must be idiots. 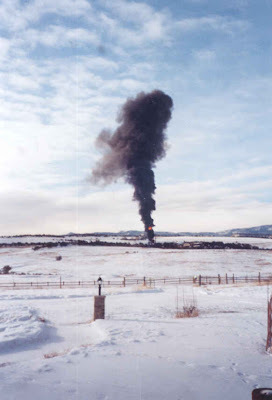 New rules being considered by the Colorado Oil and Gas Conservation Commission would limit flaring like this, keeping the skies clean and communities safer. Industry opposes this measure. The State of Wyoming is facing something unprecedented: unhealthy ozone pollution. Ozone, otherwise known as smog, is long-known as an urban health threat. In the Rocky Mountain region though ozone is beginning to plague even rural communities, including those in western Wyoming. This week, the Wyoming Department of Environmental Quality issued an ozone health advisory for the western part of the state, the first time ever that such an alert has been issued. 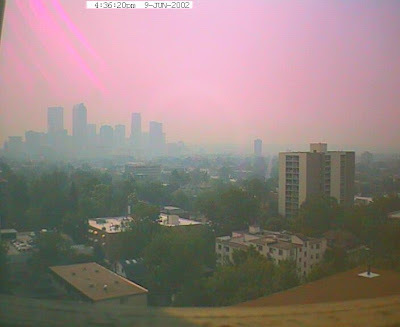 The reason for this unhealthy air pollution? Rampant oil and gas drilling. Oil and gas drilling is spewing out pollutants that form ozone. These pollutants are coming from drill rigs, pollution venting at wells, and natural gas compressor engines. And more drilling is on the horizon. EnCana announced this week it wants to drill nearly 100 new oil and gas wells in western Wyoming. The other part of the problem is that the Bureau of Land Management, which has given the green light to massive amounts of oil and gas drilling in western Wyoming. Just last week, the EPA ripped the Wyoming Bureau of Land Management for failing to protect air quality. It's a mix of rampant oil and gas drilling, growing air pollution, and the failure of government oversight. Unfortunately, for Wyomingites it adds up to a serious health risk. It's time to rein in rampant oil and gas drilling, clear the air, and safeguard public health throughout the Rocky Mountain region, in urban and rural communities alike.